For the last couple of weeks, Ella and I have made a little game of finding Halloween books for kids with the orange cat sticker on the book spines at the library. She’s become very adept at spotting them and we now have an enormous stack of Halloween books sitting in our living room. Per usual, most holiday books are deeply underwhelming to me, but here are some of the ones we’ve really been enjoying over the past few weeks (and will continue to until the library won’t let us renew them anymore). I do not always like parodies (Goodnight Goon does not warm my heart), but this Madeline riff just hits my funny bone. The pictures aren’t overly scary and any fans of Madeline will probably be deeply amused. I like this slightly longer Halloween story about a boy who puts his beloved jack-o-lantern out in the garden when it starts to rot after Halloween and then watches all year as the seeds sprout and a new pumpkin grows from the remains of the first. This is a darling little Halloween book (or board book) for quite young children. Mouse is out on Halloween night and keeps seeing fall/Halloween objects that scare him, but after each one, he follows up his “eeek!” with a “not so scary after all.” I die of the cuteness when Ella recites it to me. Little piglet Herbert is very dubious about Halloween. His dad LOVES Halloween and can’t wait to spend it with Herbert and slowly, Herbert starts to think Halloween might no be so bad. Especially if he can be a fierce tiger. This is one of my newest favorite Halloween books for kids – it’s just so sweet. I usually have a pretty strict rule about our Halloween books for kids ONLY coming out in October, but this one is so fun and my girls love it so much, I’ve allowed a few readings the rest of the year. Brunhilda is a wicked witch. She loves making trouble and adores eating spiders and being generally as hideous as possible. Until one day, her cat stirs up a potion that makes everything backward, including her nasty spells. This amazing Halloween book is made of photographed three-dimensional scenes and it’s SO cool. The little girl in it is CONVINCED her mom is a witch and showcases all the evidence for it. I just discovered there is a sequel, Happy Halloween, Witch’s Cat!, which I can’t wait to read. When you think about Halloween colors, you probably think orange and black. But it turns out ALL colors can be Halloween shades in this clever Halloween picture book. And I’m still obsessed with this little video of Ella reading it aloud a couple of years ago. 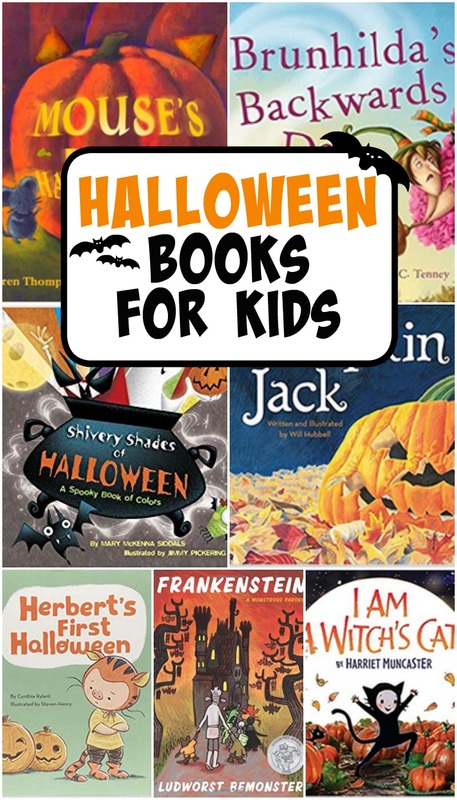 Any other amazing Halloween books for kids that I left off this list? Let me know in the comments! And you can find more of my Halloween picture book recommendations here and here, plus some of my favorite Halloween read alouds! Pumpkin Jack has been one of our favorites for the last several years. I think I should just buy our own since counting on a library copy in October is ridiculously optimistic. I TOTALLY forgot about the book Popcorn… LOVE that book! Wow. I want to go find it and read it for me! Too fun! Popcorn was one of my favorite books when I was a child ~ thank you for reminding me of that. Going to find it and look forward to reading it to my girls ~ hope they like it as much as I did!!!! Joining the choir here – I had totally forgotten about that book Popcorn, but now that I see the cover I remember loving that book as a child, too! I love the Popcorn book! I remember reading it as a kid. Finn has loved all of these (except Pumpkin Jack because that was unavailable). Also, "Ghosts in the House." We have been reading them for the past couple of weeks or so. I am amazed at how much he enjoyed the Oliver and Amanda book. That is actually one of his favorites.